As of April 2017, Lawry's All Purpose Beef Seasoning 17.5oz has been replaced with Lawry's Cracked Pepper, Garlic and Herb Rub 24oz. Same great product larger size bottle. 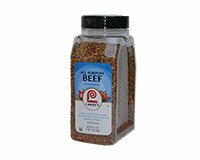 Lawry's Beef Seasoning is great when used as a rub for roasts or steaks. Use Lawry's Beef Seasoning in beef recipes for stews, meat loaf, meatballs, and burgers. Brush a 2 lb beef tenderloin with 1 tbsp olive oil on a shallow foil lined pan. Sprinkle 2 tbsp Lawry's Beef Seasoning over meat. Roast in a preheated 350° F Oven 35 to 40 minutes for medium-rare to medium. Let stand for 10 minutes before slicing.